This Nomination Yellow Gold Labrador charm is the perfect gift for an animal lover. It features a Labrador's face in the centre of the charm. This would add a personal touch to any Nomination charm collection. 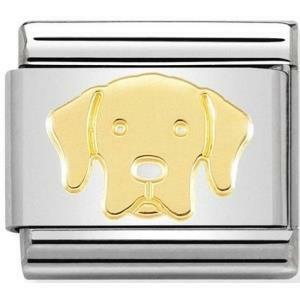 The Labrador charm is made from Stainless Steel and is plated in 18k Yellow Gold. The symbol is crafted from 18k Gold and enamel. This charm fits on a classic sized starter bracelet.